SMART: Available in Smart stores nationwide and online with Plan 1299, inclusive of 4.5GB open access data and 10GB data for video streaming, unlimited texts to all networks, and 50 minutes calls to all networks. Learn more HERE. GLOBE: Get the Nova 3i for FREE with ThePLAN 1499 with 8GB of data, unlimited calls to Globe/TM networks, and unlimited texts to all networks. Learn more HERE. LAZADA: Purchase online and get a FREE bluetooth speaker and FREE shipping nationwide. Get it HERE. 1. 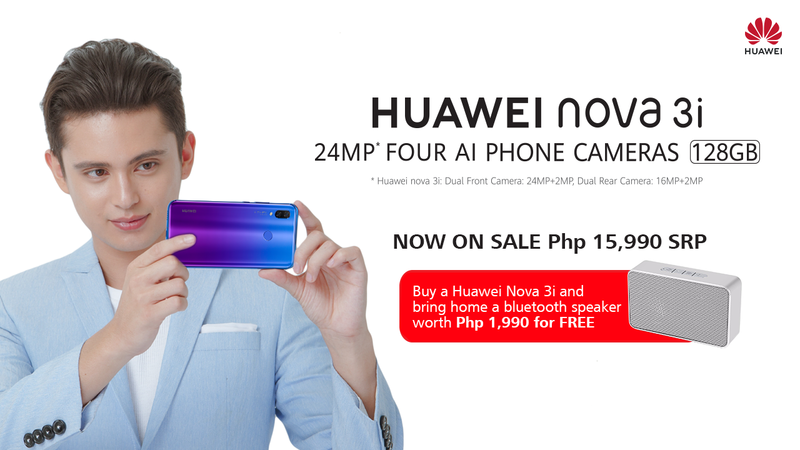 The promotion is open to all customers of HUAWEI Device Philippines purchasing to all HUAWEI Experience Stores (HES / H) and Multi-Brand Stores. Promotion will be on the period of July 28, 2018 to August 31, 2018 (“Promotion period”). HUAWEI end-users are entitled to the freebie for every purchase of HUAWEI nova 3i unit. Seven Six Seven Center SINSUAT AVE.
P. ALDANA CELLPHONES MAGSAYSAY ST.
Zamcell Mobile Center Inc. MAGNO ST.
CELLCOM WORLD COMMUNICATIONS TRADING BONIFACIO ST.
4. All employees of HUAWEI Technologies Philippines, partners and agencies including their relatives up to the second degree of consanguinity or affinity are disqualified to join the promo. 5. Freebie will be provided upon purchase of consumer in Promotion date itself.